Join the discussion on our forums! 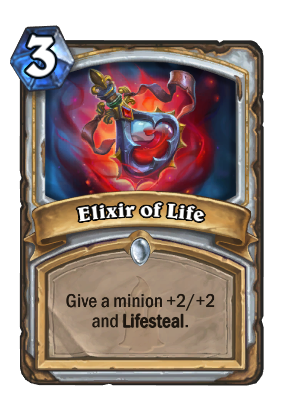 Come discuss Unidentified Elixir over in our dedicated Unidentified Elixir discussion topic. So you need to be at 1 health, completed the quest, have your opponent have less than 9 health worth of minions in order to OTK. And it doesn't hit through any armor. AND it only has a 25% chance of landing on elixir of life. Actually 78 spread damage -- 2 Shadowboxers x 39 max health restored to hero -- if you've played Amara. I'm pretty sure it doesn't look like that in game, it seems a *lot* of the Kobolds and Catacombs golden animations didn't import properly this run. 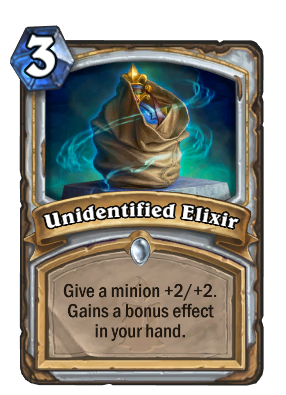 Will all classes get unidentified card? No. The set's only unidentified cards are Unidentified Elixir, Unidentified Shield, and Unidentified Maul. The developers mentioned that they're only releasing three because the tokens can be hard to memorize. Loving the unidentified cards. All effects are useful and I love the value this card could give. People are underrating this card. VERY strong in a class that can heal its minions. Not meta-defining strong, but definitely "Ugh, if my opponent has this card i'm going to hate my life" kind of card. 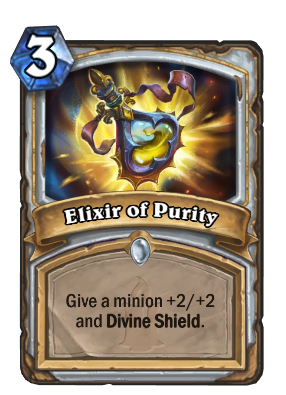 I'll be happy crafting combo Djinnies decks with this one, beautiful. How we get tokens? Are they change every turn or in the moment of drawing this will be changed to one of those tokens? Blizzard come on. Why not make this a potion so people can get it from Cabal Chemist? Why do you abandon mechanics Blizzard? Probably because Cabal Chemist was balanced around being able to pull from a very specific card pool, and diluting it drastically changes the power level of the card (See Exhibit A: Tuskarr Totemic). Not to mention the Reveal mechanic might have something to do with drawing it into your hand, so not drawing it means not revealing it.